AND LIVE DEBT-FREE EVER AFTER! ​will help you pay-off your debt, get in charge of your finances, and finally have a peace of mind and start creating your dream life. ​Has DEBT gotten out of hand in your life? Do you feel like having DEBT DRAINS YOUR ENERGY, keeps you awake at night, even affects your health? Your relationships? Your quality of life?? Do you feel frustrated, scared and even ashamed? Having debt often feels so overwhelming that sometimes you lose hope that you’ll EVER be able to pay it off. And so you wait… for better circumstances, for better timing, for better income…and in a meantime, you get deeper and deeper into the debt-hole. Debt has gotten out of hand for millions and millions of people! The Debt addiction enslaved people of all walks of life. Yet few are willing to admit it, let alone have an honest look and start unpacking their debt! There are different reasons people get into debt – from job loss, to medical expenses, to financial havoc due to divorce, to poor money management and unhealthy money patterns. The thing is… What’s done is done. It’s in the past. What’s important now is to DECIDE what you’re going to do about this financial situation. …Live in fear of debt collectors? …Keep pretending that “all is fine” and hide your true feelings – embarrassment, shame, fear? It’s not like you don’t know that something MUST change…that you must deal with this debt problem NOW. You know that DEBT DRAINS YOUR ENERGY, affects your health, your relationships, your work, quality of life. So, ENOUGH of this nonsense!! It's TIME to restore your financial wellbeing! And the first step is to stop digging deeper the financial hole you might be in right now and instead start unraveling it. There are a few things YOU CAN DO… immediately. NO MORE procrastinating. NO MORE excuses. NO MORE waiting for a better timing or better circumstances. It’s YOUR TIME to ACT on your desire to be debt-free. LIVING WITH DEBT IS NOT YOUR DESTINY. And that’s what “Unpack Your Debt” bootcamp is about! Uncover whether you developed an addiction to debt. As quickly as YOU allow it! I know, it’s an ambitious goal for this bootcamp. I also know that YOU CAN MAKE PROGRESS OR MAKE EXCUSES. These are two choices, really. I will be your guide during this 5-day bootcamp. We’ll go step-by-step over strategies for living debt-free. do the exercises, and don’t let your fear and doubts stop you! Millen, not having you online for an entire day made me realize how much you give. HOW MUCH YOU GIVE. Your words, replies, quotes, reminders. You are like the Fairy Godmother who watches over us, encourages use, prods us. We are so lucky, so blessed to have you in our lives. “Thank you” is a word that cannot encompass how I and, I think many of use, feel. YOU WILL START CREATING THE LIFE YOU WANT. (from the comfort of your home) for FREE! I loved the way Millen Livis helped to make this practical. I have worked with the concept of doubling your money daily and it was only when I was putting in the increase daily into an Excel spreadsheet and really allowed myself to ‘own’ the money and what I would be able to do with it, that wealth became real for me. I share about dreams and mindset with my clients. I realised I was blocking my REAL dreams through fear of going back into debt, so guess what? I kept going back into debt. I am able to grow into charging for the worth I give and to grow the legacy of my dreams. I truly appreciate you and the value you have added to my life. - Is this training really free? Why? The Unpack Your Debt Bootcamp is free for you - as long as you can attend live sessions, or watch them within a 24 hour window. Life-long access to the course is charged at $248. At the end of the Bootcamp, I'll be opening the doors to my brand new Become Financially Savvy training - a special opportunity for 10 women who would like my personalized support to transform their financial reality forever and get a clear pathway to becoming Financially Independent. 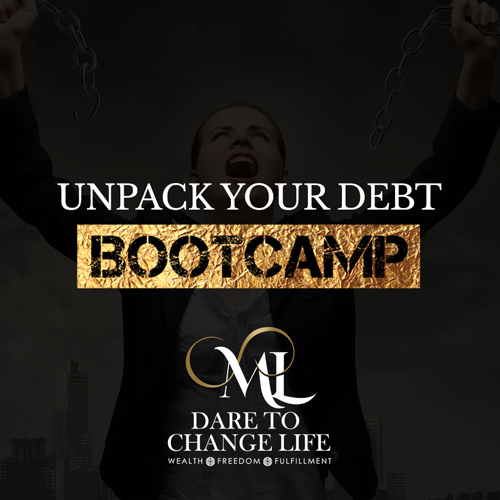 Whether you'll be called to take the next step and join the Become Financially Savvy training or not, the Unpack Your Debt Bootcamp will make a real difference in your life. - I can’t make some of the live training. Will there be replays? - I’m not in debt right now. Will I still benefit? Yes. People from all walks of life get into debt. For many, it’s a very subtle downward spiral. This bootcamp will help you become more aware of dangers of debt, understand different kinds of debt, and get clear guidelines to be in charge of your finances and live debt-free. Managing money intentionally is my zone of genius. If you want to master your money so you’ll never be mastered by money, this bootcamp is the right place for you to be. STRATEGIES TO LIVE THE DEBT-FREE LIFE so that you experience PEACE, POWER and PROSPERITY. Yes! I Want To Be Debt FREE!